Three recent rabbinical court rulings have asserted far-reaching and controversial authority in divorces of couples married in a civil ceremony. The Interior Ministry requires Jewish couples to provide proof of divorce from a rabbinical court to get their divorce registered, regardless of how they married. But a recent ruling by the Netanya Rabbinical Court stated that in such cases, the rabbinical court also has authority in matters of child support, custody and joint property. Jewish law recognizes civil unions, it said, and therefore may also discuss their dissolution. 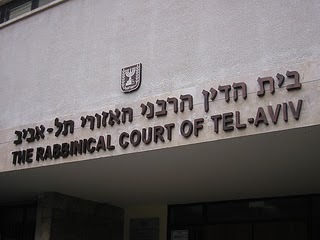 The ruling contradicts a 2006 High Court of Justice decision that if the divorcing couple wed in a civil ceremony, all such matters must be handled by civil rather than rabbinical courts, since the latter "deny the property-related manifestations of their married state," as then-Supreme Court President Aharon Barak put it. Two other rabbinical courts, in Tel Aviv and Haifa, went even further, saying they were authorized to discuss conditions set by the husband for divorce, just as they do in religious divorce cases. In the Haifa ruling, issued in November, the husband - who is allegedly violent toward his wife - did not want the divorce. The court therefore refused to dissolve their civil marriage. The Netanya court heard the case of a Jewish couple that married in Cyprus in 1998 and now has two children. Unusually, the husband began divorce proceedings in the rabbinical court rather than a civil one, and also asked it to rule on child support and property division. The wife objected, but the court sided with the husband and heard the case. According to Prof. Ruth Halperin-Kaddari, head of Bar-Ilan University's Rackman Center for the Advancement of Women's Status, the rabbinical court judges "are bringing tens of thousands of couples who chose not to marry through the Chief Rabbinate under their control." In contrast, Prof. Eliav Schochetman, a lecturer in Jewish law at Sha'arei Mishpat college, termed the move positive, saying that far from denying women's rights, the rabbinical courts are treating women married in civil unions as married women in every respect. But Halperin-Kaddari called that view "naive." 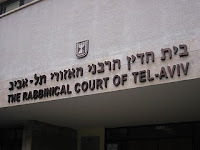 The 2006 High Court ruling essentially adopted the view of the Rabbinical Court of Appeals that civil marriage had some standing in Jewish law, but could be terminated by rabbinical courts in a fairly simple process. However, the justices continued, rabbinical courts could not discuss other divorce-related issues, such as child custody or property, lest the husband seek to exploit provisions of Jewish law that favor the man in order to deny the woman her rights. The Netanya Rabbinical Court based its ruling on what is termed "custom of the state," referring to a 16th-century point of Jewish law that dealt with women forced to convert to Christianity who then married other forced converts. This concept held that even though these were essentially civil marriages, the women nevertheless had property rights, just as they would in a Jewish marriage. Batya Kahana-Dror, who heads Mavoi Satum, a group that assists women who are denied religious divorces, responded to the rulings by calling for an overhaul of Israel's marriage and divorce laws. "Once again, we see that civil marriage is not immune to the rabbinical courts," she said.